My Flashback Friday post this week is late. The flu decided to pay our home a visit and has been an unwanted guest all week. All 3 kids have had their fair share of colds - but this was the first time they've ever had the flu; a pretty good track record considering the girls are 7 and 6! Unfortunately, my girls were the most affected (high fevers, chills, head/body aches, nausea, vomiting, congestion, & cough - the works, essentially). Yesterday my youngest daughter Halimah (Little Bee) was in tears because her tummy hurt so bad. I was furious that the doctor's office hadn't returned my call after waiting 4 hours so I called back and told them she was getting worse. The best they could do was book a 6pm Urgent Care appointment... I looked in my daughter's crying eyes and knew there was no way she'd be able to endure waiting another 4 hours! Off we went to the Emergency Room instead... well, to make a long and frustrating story shorter - by 5pm we still hadn't even been called back to the ER triage! My fury raged on - but I kept my inner "crazy mom" in check. I ended up leaving and taking her to the 6pm Urgent Care appointment - where she was immediately seen the moment we checked in. Anyhow - this all brings me to my Flashback Friday post. 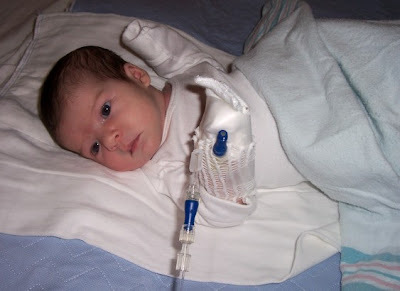 It's been almost 6 years exactly since my Little Bee was hospitalized when she was only 3 weeks old. 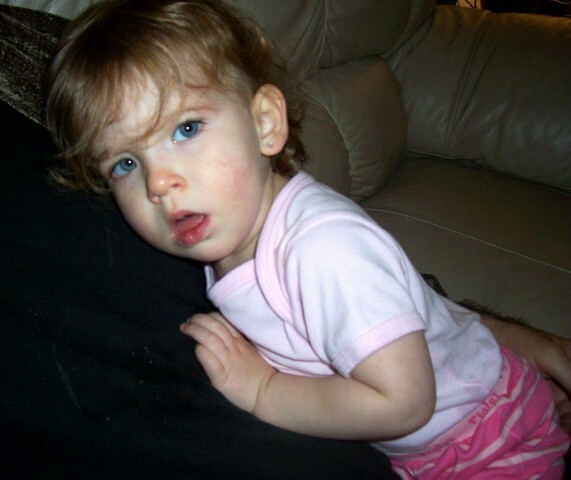 She had an alarming fever and projectile vomiting which is a huge concern for infants, especially newborns. After a couple days of testing - it turns out she had Rota Virus (which is a very nasty virus that causes diarrhea and vomiting - which leads to severe dehydration). Her big sister, Little Bug, ended up with it too while I was in the hospital and ended up making 2 visits to the Emergency Room. Hubby was taking care of her puking and poo! Today's pictures are from that time, February 2006. Note: I had a "sick moment" and initially posted this as 2008 - but it was 2006! Awww she was so little! :) What a little cutie! I just hate it when they are sick! Especially when you have to start counting hours since they actually pee'd or drank fluid and kept it down. When it get's serious like that, the inner Mama Bear turns into scared Mama bearcub.